This is a step-by-step overview that tells you what to expect when using Digit-Eyes. the bottom button which goes to an informational page about the app. Note that if there is not enough light for the app to work, the app either use the flash (iPhone 4) to get enough light or will warn you that this problem needs resolved. 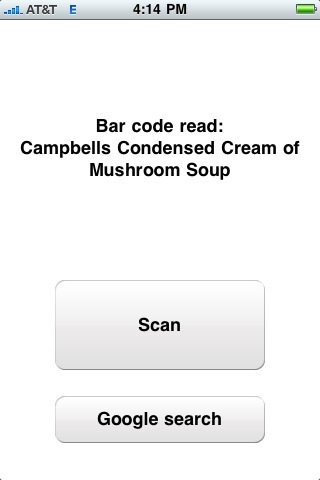 When you click the "scan" button, you'll hear a beep to let you know the program is working; scanning will then start. 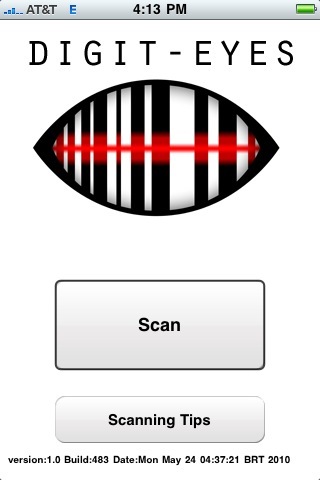 While the scanning is being performed, the app makes a clicking sound so that you know the scan is still running. As soon as a recognizable code is found, Digit-Eyes beeps again. 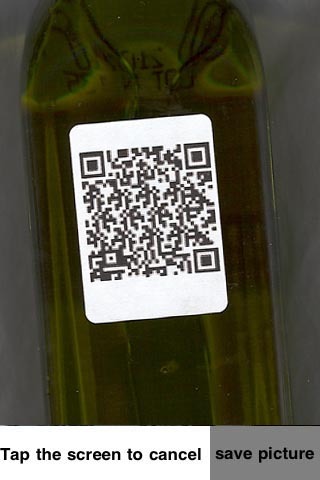 While the primary purpose of the software is to allow you to label items that don't otherwise have labels, Digit-Eyes can also recognize manufacturers' barcodes -- UPC, EAN and ISBN. The label is a manufacturer label. When an audio label is found, and there is a prior recording for it, the recording will be played to you. 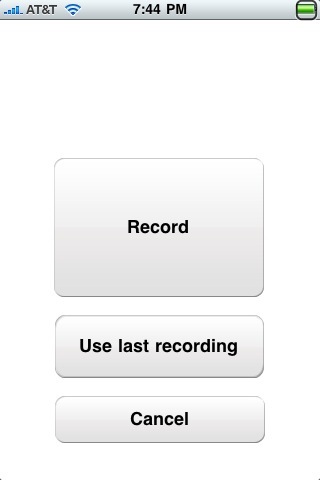 After it plays, or if there is no recording, you have the option of recording content. You can record up to 1,000 hours of labels on the 16GB iPhone, so you can make extensive "to do" lists, record detailed washing instructions or even have the pharmacist record what the medication is and any restrictions on its use. If you have previously recorded or played back a recording, you can duplicate it with a single click. This feature is very handy if you are (for instance) recording labels for food in the fridge where you want to record the date that the item was put away. Record it once and then just copy it to the individual label for each item! When a text label is found, Digit-Eyes will simply voice the content to you. 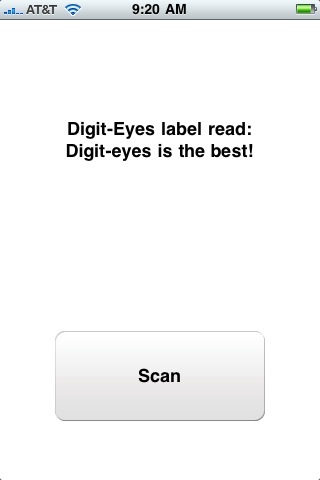 When a UPC, EAN or ISBN barcode is found, Digit-Eyes will send it to our main database where it will be looked up. After the result is found and displayed, you can click a single button and use the information to search Google if you'd like more information about the item. In the unusual case where the item cannot be found, you can enter your own description of the item if you wish. So how do I make labels? First, you'll need to get some labels. They are available online and from many stores -- we even found some at Wal-Mart. Put a sheet of labels in your computer printer. Using your normal browser, go to the Digit-Eyes website, log into your account and select the make and configuration of the labels you have and whether you want audio or text labels. You'll immediately get a PDF file immediately that contains your labels. Print it and you're done. Click here for a list of all supported labels.